Notwithstanding a drop in oil and gas exports in the first half of the year, the sultanate is set to stay on a growth path. Projections from the International Monetary Fund indicate that the economy will advance 3.4 per cent this year and the next. The total value of all exports for H1 2014 declined by 9.6 per cent to RO10 billion ($25.9 billion), mainly due to a decrease in oil prices. However, the silver lining was that non-oil exports grew 3.3 per cent to reach RO1.85 billion. The National Centre for Statistics and Information (NCSI) attributed non-oil export growth to a 4.5 per cent increase in the value of minerals exports, which took their total to RO534 million. Plastics and rubber products also made strong contributions, their exports rising by 34.3 per cent to reach RO175 million. Oman continues to vigorously pursue growth in all sectors that performed well in exports, raising expectations that the non-oil segment will continue to advance from the effort. The segment is also being boosted by strong performance in tourism. The oil and gas sector continues to be a significant contributor to the national economy, accounting for half the GDP. Its importance also lies in its employment-generation capacity and the trade and commerce those hired can trigger through their earnings. Just recently, BP awarded two contracts worth $730 million for the construction and operation of drilling rigs for the Khazzan onshore gas project. A $400 million contract went to KCA Deutag, while the remainder of the contract value went to Abraj Energy Service, a local operator. Earlier, Jacobs Engineering was awarded a $2 billion deal to develop the site’s infrastructure and Petrofac won a $1.2 billion EPC contract to build the central processing facility. Another $90 million went to local Omani firms for a host of connected requirements. The value to Omani firms and citizens involved with just one project through its different schemes is understandably substantial. Another major project set to take off in right earnest is the Duqm petrochemicals refinery for which invitations have gone out to EPC firms. The refinery will help develop the local economy in a part of Oman that was a few years ago little more than a bleak landscape or at best a hub for fishermen. 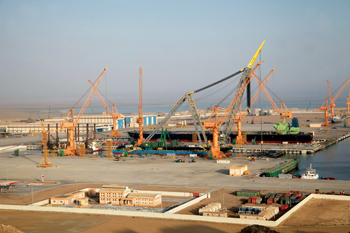 Duqm, in central-eastern Oman, is fast developing, and fine examples are the drydock, which started operations a few years ago, and an industrial and logistics zone being created. After Sohar and the Salalah Free Zone, Duqm is the most exciting prospect for the Omani economy. Earlier this year, Oman Drydock Company (ODC) announced it completed work on the Ibra LNG, a vessel owned by Oman Shipping Company. It was the first membrane containment LNG vessel to be repaired at the yard after ODC passed stringent tests to receive the GTT quality system licence for LNG vessel repairs. Daewoo Shipbuilding and Marine Engineering Company is managing and operating the drydock company under a contract. Sheikh Khalil also cited ODC’s geographical location as a key selling point for the Asia to Europe shipping route as well as the East African and Indian offshore industries. One sign that Duqm is getting busy was the start of a four times a week Oman Air service. Some $15 billion is being invested in the area to create multi-industrial, maritime, commercial and logistics hubs. As well as a Duqm petrochemical plant and refinery, the governorate will witness the construction of housing complexes, beachfront hotels and railway connections to link up with Saudi Arabia and the UAE. Overall, Oman’s large, medium and small companies could get pretty hectic soon with the projects market expecting an influx of up to $26 million in capital expenditure in 2015. Add to that the investments that will come into play for building railway infrastructure and enhancing port and airport facilities all over the country. According to Meed Projects, as much as $145 billion worth of schemes are currently under way or will be awarded. The projects in that category include the Khazzan and Makarem Fields, the Suwaiq IWPP and the Haima Solar Thermal Hybrid Power Plant. The Takamul downstream project and Orpic’s Liwa plastic project initiative will both attract $13 billion. The existing and up and coming developments were the focus of the Meed Oman Projects Forum 2014. Meanwhile, a push was made for public-private partnerships in building transport infrastructure. Isabelle J Kayaloff, managing director of UK and Associates GmbH, presented a paper at the Oman Public Transport Conference suggesting that private investment could be mobilised for developing, for example, roads where traffic usage was huge. She conveyed that financing could take different forms including Build, Operate and Transfer or Design, Build, Finance and Operate. An area of challenge for Oman is the logistics sector. 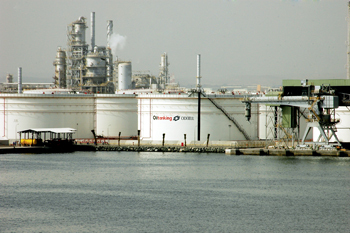 It has two modern ports, one in the north of the country, Sohar, which has been developed to serve as a support base for the industrial hinterland around the harbor and the other in the south, Salalah, which is also being seen as key to the development of the Dhofar region, bordering Yemen. Both ports are strategically located and Omani officials feel it would be worth the while for shipping companies and shippers to consider using them. Sohar is competing for traffic with Jebel Ali and other top ports inside the Gulf, as part of a far-reaching plan by Oman to diversify its economy beyond oil. The port, not far from the UAE border, has raised its container terminal capacity to 1.5 million teu from 800,000 teu previously and plans to ramp that up to 4 million teu within the next three years. Sohar would need the expansion as container traffic is being relocated to the port from Muscat and the possibility exists that more shipping lines might begin considering Sohar particularly after an aggressive marketing and advertisement campaign that the Omani port has undertaken, going right to the door of its main competitor, Jebel Ali Port. Oman believes its industrialisation drive could do with further bursts of investments. Omani officials are in touch with Japanese, Indian and European authorities to have them interested in investing in the sultanate’s mineral resources or manufacturing potential. At an Oman Investment Forum held last month in Tokyo, Japanese entrepreneurs were invited to view the sultanate as a gateway into key markets in the region. Faris Al Farsi, Ithraa’s director-general of investment promotion, stated: “Japan can become a key partner for Oman as we look to attract specialist investment into the Sultanate’s ports and special economic zones. As it is a major manufacturer of high-quality machinery, technology and electronics, our focus is to bring Japanese expertise to assist us with the development of major projects in the logistics, fisheries, petrochemical, tourism and manufacturing sectors across the sultanate.” Ithraa is Oman’s Public Authority for Investment Promotion and Export Development.